It's good to see a 42-inch Freeview HD 3D TV that's unapologetically populist. Embracing a Primark aesthetic (affordable but on trend) and keeping a lid on advanced panel tech, it's priced to appeal to everyone looking for a big brand thinscreen with net-connectivity. 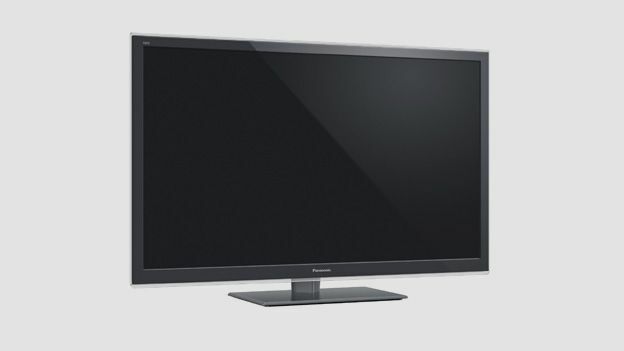 Affordable yet edgy, the 42-inch Panasonic LX-L42ET5 is clearly looking to put the squeeze on rivals like the LG 42LM640T and the 40-inch Samsung D6510. Need more or less glass? The ET5 also comes in 32-, 37-, 47- and 55-inch guises. But while value appears high, compromises have been made on performance. Those keen to jump aboard the streaming TV bandwagon will find the ET5 a comfortable set of wheels. Take the set online integrated Wi-Fi or wired Ethernet and you'll soon have access to Netflix, Acetrax, BBC iPlayer, BBC News, YouTube, Fetch TV and Dailymotion, amongst other services. The set will also socialise via Skype, Picasa, Facebook and Twitter (the latter while you watch the box), there's even an HTML5 browser for basic web wandering. Those that still have spare time can download games from the connected apps store (bizarrely, priced in Euros). The TV's resident USB media player handles most everything without quibble. All popular AV file formats play from USB, including FLAC and MKV. Across a network from a NAS, MKV support goes AWOL though. Not quite as svelte as its LX-42DT50 stablemate, the ET5 still scrubs up well. The glossy grey frame, edged with translucent plastic (optimistically described by Panasonic as crystal), is smart but casual, although the bezel is a relatively deep 25mm. A full cadre of connections are on offer, including four HDMIs (one of which is ARC compliant), component & SCART via shared adaptor, Ethernet, optical digital audio out, PC and phono AV. There are also three USB ports and an SD card reader, so there's no shortage of ingress into the set. Economies in technology are clearly visible when this screen is powered up. Most obviously, the set's motion resolution is limited. Even with Panasonic's IFC (Intelligent Frame Creation) processor on Max image definition is limited to around 850 lines, and comes with a fair degree of smudgy motion artefacts. This isn't a screen best suited to sports. That said, the set's LED edge-lighting is actually rather good with only low levels of light pooling close to the frame, however blacks are more accurately dark grey. The TV's Passive 3D performance also gets a thumbs-up – provided you view square on. Mount this TV above a fireplace (for example) and its 3D images fall apart in spectacular fashion, as off-axis vertical viewing is non-existent. Four pairs of polarising glasses are supplied in the box. The screen's audio performance can be kindly described as functional. The 2 x 10w speakers try hard not to offend, and largely succeed. While this ET5 may not offer of this world performance, as a mainstream internet-enabled proposition is does a commendable job. Image quality is decent, caveats about motion clarity and black levels not withstanding, and its Passive 3D implementation works a treat.